Artes Mundi 7, National Museum of Wales, Cardiff. The Minffordd path to the five summits of Cadair (or, for us Gogs, Cader) Idris rises steeply from Tal y Llyn to Llyn Cau. 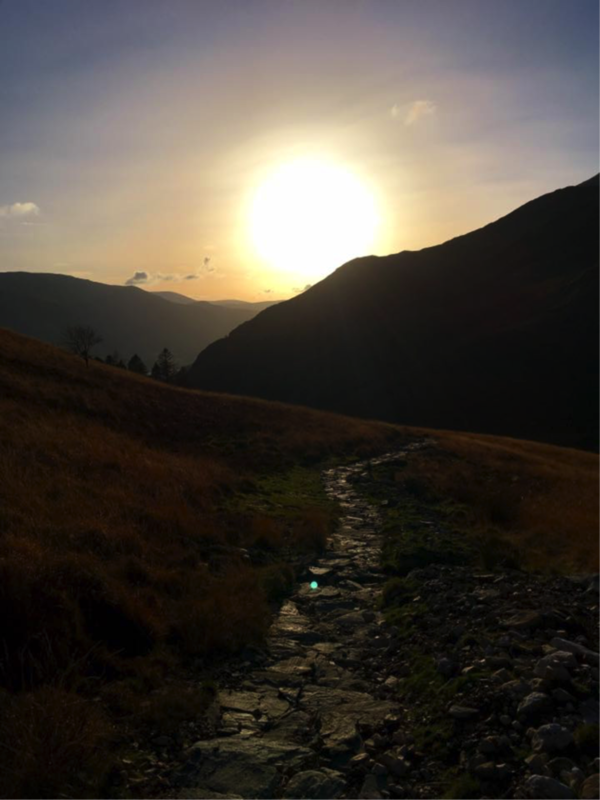 On Thursday morning, 24 November this year I walked slowly uphill from a nearly-empty car-park, each step falling on ground so familiar my feet were almost on auto-pilot. Each turn evoked a memory, some recent, some very distant, recalling unbidden snatches of conversation or the sound of a voice. Walking alone, enveloped by the silence that follows grief like my shadow on the path, I soon reached the abandoned hafodtai, roofless but with their stone lintels still firm over the doorways and windows. I always pause there, where the ground evens, to catch my breath and to be reminded that this was once a settled, populated landscape. Not a playground for walkers, but summer grazing land, an intrinsic, productive part of the farming economy, and thus also of the social and cultural fabric of Meirionnydd. From the ruins, the path rises gently to Llyn Cau, the glacial lake in the cwm at the foot of Craig y Cau. Then follows the steep but always exhilarating climb up the south ridge to the tops of Craig Cwm Amarch and Craig y Cau itself, and from there to the summit of Pen y Gadair, the highest point of the mountain. Llyn Cau and Craig y Cau, from the southern ridge, Pen y Gadair in cloud to the right, 24 November 2016. From the trig-point, on a reasonably clear day (admittedly, a rare event), you can visually take in the subsidiary summits of Cyfrwy and Tyrrau Mawr above the Mawddach to the west, and the whole of Llŷn. 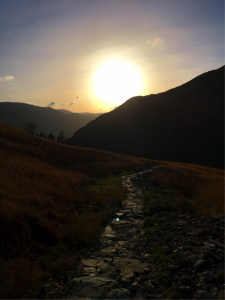 The long arm of the wild Rhinog, and beyond them Eryri, hold your attention to the north as the faint path traverses the summit ridge to reach the final, breathtaking Mynydd Moel near the mountain’s north-eastern edge. 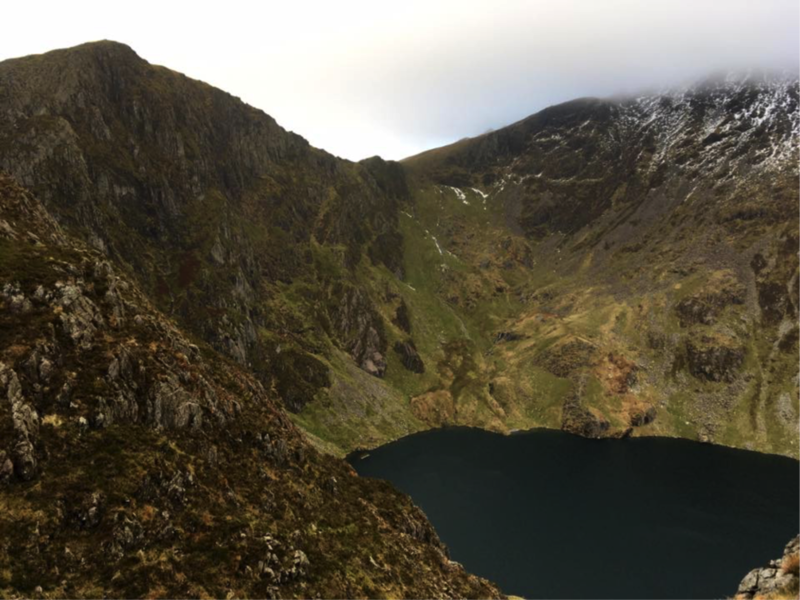 From there, the track descends roughly and precipitously to the point where Richard Wilson probably sketched his celebrated ‘Llyn-y-Cau, Cader Idris’ in circa the early 1770s. I have, over the years, grown to be more forgiving of the mildly over-dramatised upward stretching of Wilson’s Craig y Cau, and the strange scattering of individual figures in distorted perspective. For one thing, it’s a point from which you can trace the day’s walking almost in its entirety, as you can in Wilson’s painting. Born in nearby Penegoes in 1714, Wilson’s curiously gentle depiction of Cadair Idris stimulated not only a host of later landscape painters, from Joseph Mallord William Turner to Alfred de Bréanski, to trudge over its slopes in his footsteps, but also a veritable Victorian tourist industry as well, with enterprising Dolgellau folk taking visitors on horse-rides the long and easy way up the Pony Path to a café (of sorts) at the summit of Pen y Gadair. 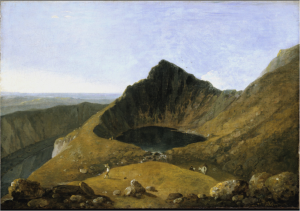 This one painting has, for two and a half centuries, framed the classical view of a magic mountain, an upland Wales rendered beautiful for metropolitan eyes to enjoy. Nine days later, Yasmin and I are weaving our way through Christmas shoppers and the noisy Cardiff traffic to see an exhibition at the National Museum of Wales in Cathays of the short-listed candidates for the Artes Mundi Award 2016. We have come in particular to see our old friend John Akomfrah’s film about emigration and displacement, but then we step into a large darkened room, and find ourselves standing, awestruck and aghast, in front of this. Bedwyr Williams, Tyrrau Mawr, 2016. 4K Video Installation 20 minutes video loop. Artes Mundi 7 installation view, National Museum Cardiff, 2016. Courtesy the artist and Limoncello Gallery. Here again is Llyn Cau, with Craig y Cau above it, and Pen y Gadair just out of view in the cloud. On its rocks and scree rise the towers of a brand new city, named by its architects after one of the mountain’s western peaks, Tyrrau Mawr. My first, admittedly unkind, thought is that it resembles an early stab at the computer game, SimCity, which turns out to be about the only trace of Bedwyr Williams’s trademark irony here. I suspect you’ll find few other comedic twists among these cold, gleaming glass and concrete towers. We confront the huge scale of the digital canvas, its immersive combination of music and a spoken narrative that relate the story of a song about a twenty-year old city, without roads, and with only the merest hint of human habitation as tiny lights switch on and off in apartments and offices. The emptiness of the quay-side, the theatre and the flood-lit sports-field further accentuate its fragmented, alienated human presence. 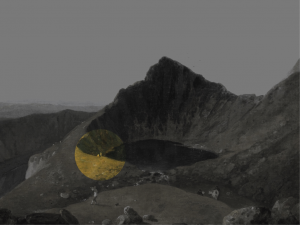 The lens that focused the image of the mountain appears to have been placed closer to the lake than the spot where Wilson put his easel, on the other side of the cwm, some half way up the southern ridge, near the point where Wilson’s two figures are standing together (below). His photography quotes Wilson, but gives him a different accent, perhaps even a different language. Certainly, he gives his Llyn Cau a different purpose. Tyrrau Mawr’ shocks. It is a raw, brutal work. For the first few moments I assume it to be a still image, before I slowly realise that it pulses, like a living thing, the clouds blowing to the north-west, as does the smoke rising from the dark tower in the centre, the water in the lake lapping gently. In its twenty-minute cycle from evening to dawn, the light constantly changes position. Its stillness, the hard stone of the mountain, the sun’s reflection lighting up in sequence each detail of the ‘great towers’ brings a calmness to the composition that renders it exquisitely beautiful. It reminds us of the melancholy of a cathedral. Yasmin, a fan of the artist since seeing him at his first exhibition at Birmingham’s Ikon Gallery in 2012, curated by the ever-innovative Jonathan Watkins, whispered to me as we finally walked out, ’It’s like Caravaggio’. Ein Caravaggio Cymraeg, yn wir. Her hyperbole was measured. 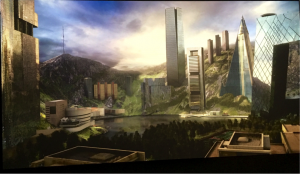 Williams really is playing, mysteriously, with light, and the digital matte painting techniques he uses are, if nothing else, painterly. His exhibition, The Gulch, now showing at the Barbican until 8 January 2017, is described by its curator as the work of ‘one of the contemporary art world’s most exciting and innovative artists’, so perhaps her remark is not so overblown after all. Cadair Idris is no mere contrasting, if picturesque, background here, not an empty stage where the architectural drama unfolds. It’s a place of myth and memory. Idris was a giant of learning, master of both the ancient arts and the cosmic sciences. The hell-hounds of the Mabinogi hunted his mountainsides, and the long skyline is inscribed with stories – of religious zeal, poetic gifts and madness. Where Richard Wilson made Cadair Idris look serene and almost pastoral, Bedwyr Williams renders it terrifying. Here is a Brazilia or a Naypyidaw waiting to happen. A new Shenzhen built on concrete poured over a national park, the grandiose and overweening arrogance of Trump Towers desecrating the sublime. In the turning of a fragile and loved psychosocial space, whose cultural geography runs deep, into nothing more than ‘foundations’, I see the burning of Penyberth, hear Gwenallt’s blistering Rhydycymerau, remember Tryweryn and Aberfan. Yet we’re told that the city houses people just like us, busy with the micro-details of their lives. It’s just that we don’t see them. They too have been subsumed by the great towers. ‘Tyrrau Mawr’, by observing so unwaveringly the erasure of layers of history and memory, and the building of new ones, is a work of quiet fury. Go see it. And next time you climb as far as Llyn Cau, stay awhile in Bedwyr Williams’s ‘Tyrrau Mawr’ and listen, entranced and horrified, to the sounds of his city. They’re the sounds of our Trumped-up times. Diwedd dydd, diwedd oes, Cadair Idris, 24 November 2016. Photography © Aled Gruffydd Jones, unless otherwise noted. This entry was posted in Walkers' Blog on 6th December 2016 by Luca Guariento.